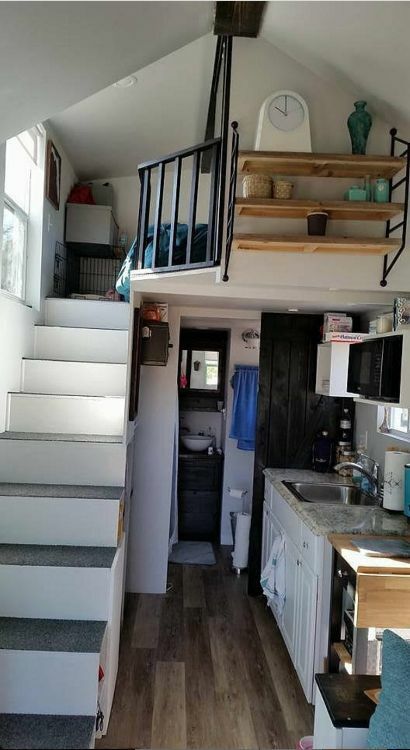 Just because a home is tiny doesn't mean the owner can't have comfort and luxury. 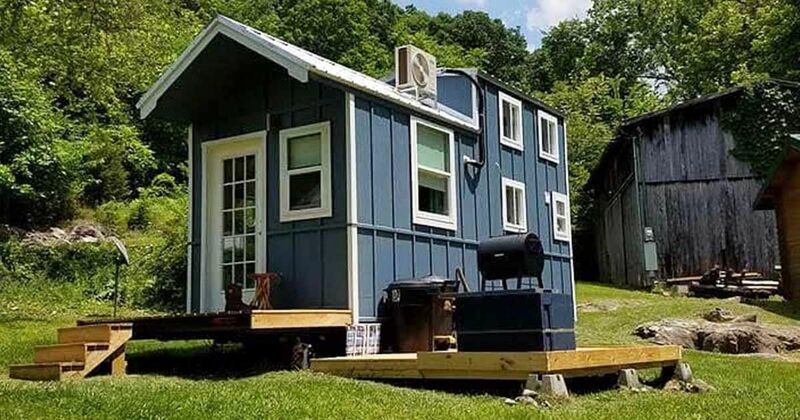 "Tiny House Nation" is a TV show "that proves size doesn’t always matter – it’s creativity that counts," and it is responsible for decorating the interior of this tiny home, the exterior of which was built by Trekker Trailers in Florida. 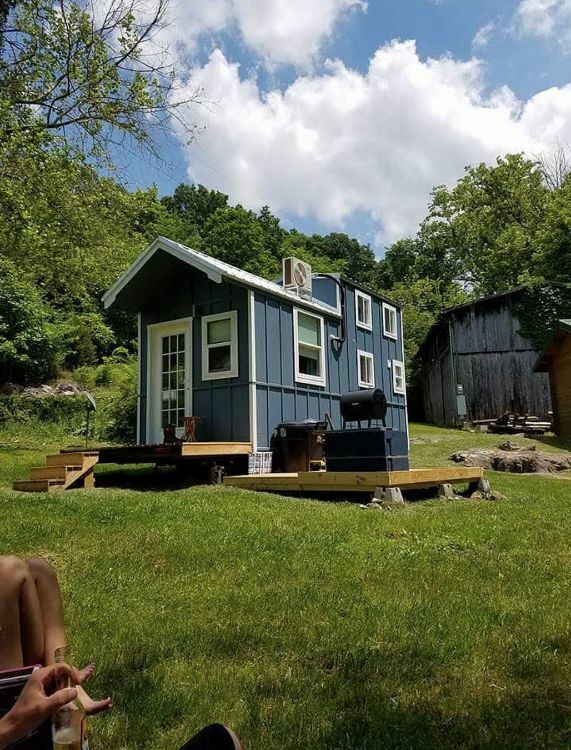 According to the "Tiny House Nation" website, the show's co-hosts, John Weisbarth and Zack Giffin, travel around America helping people turn 500 square feet (46 square meters) or less of space into their dream space. Since this house is not built from mass-produced plans but is a custom design, many of its features are also custom-built to fit the needs of the tiny space. Amy McCool, who is selling the home, shared with Smaller Living some of this home's finer features. Starting in the entryway, the couch is custom-built with storage space included in the design. A custom entryway entertainment cabinet is also part of the home's allure. The loft has a TV, and the wall space outside the loft has been turned into a great place for shelves. A ceiling fan circulates the air in the tiny space, helping regulate the temperature. The ottoman is also a custom job and opens so things can be stored inside. The area under the stairs has built-in cubbies for additional storage. A microwave/convection oven is above the sink, and two mini-refrigerators ensure you have plenty of storage space for cold items. The bathroom is a work of art. 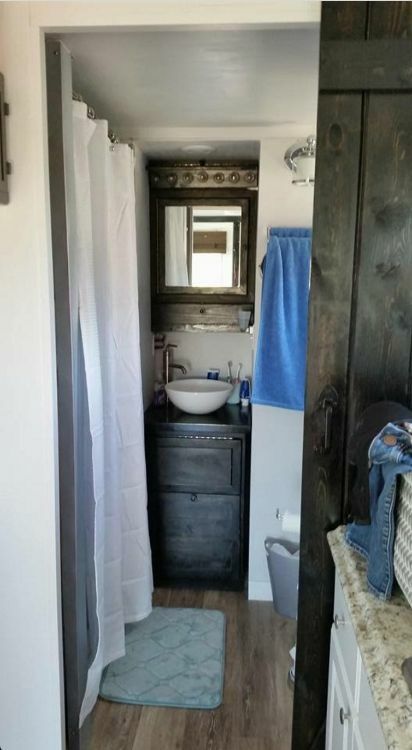 A stand-up shower is on one side, and a composting toilet is there as well. Since the sink can be easily seen through the open door, a beautiful basin sink sits on dark wood cabinetry. 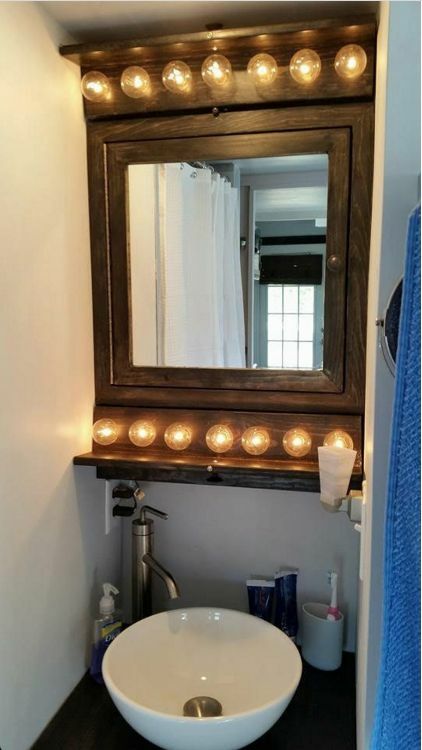 Lighting around the mirror ensures the bathroom is well-lit. 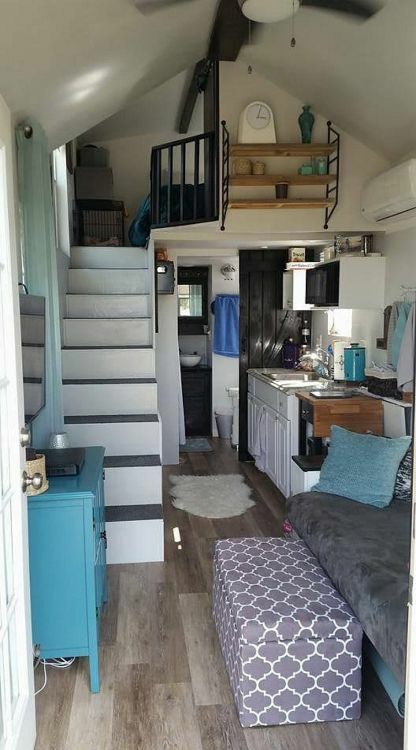 The tiny home is a full-service living space with its own washing machine and dryer tucked in right next to the toilet. 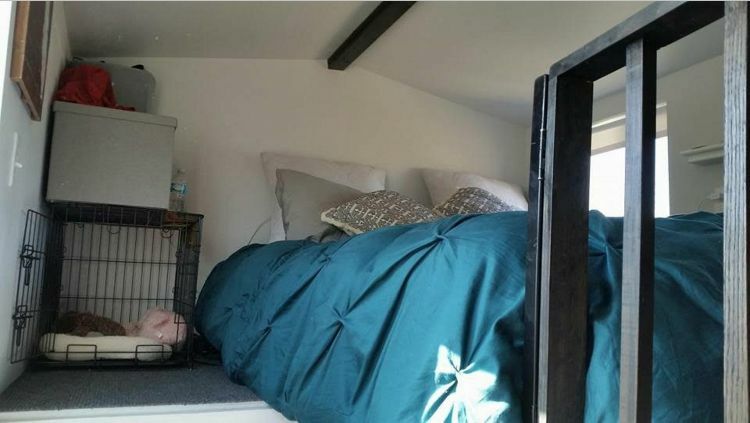 The loft, with its half-wall, affords some privacy for the bedroom. 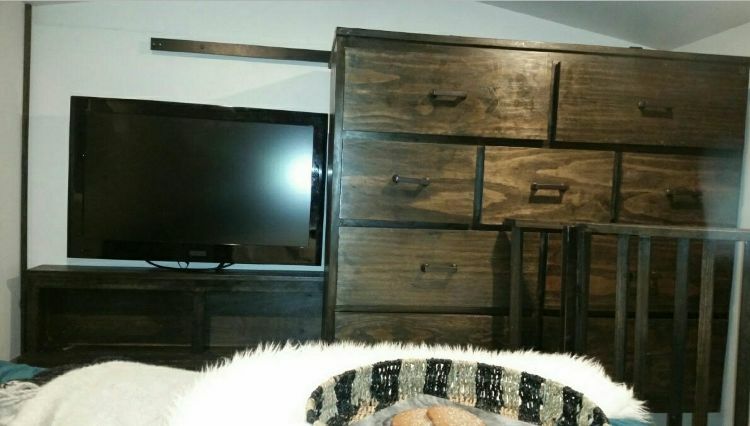 A custom dresser and entertainment center fills one wall. The dark woods warm up the space. The unattached deck outside is part of the package. 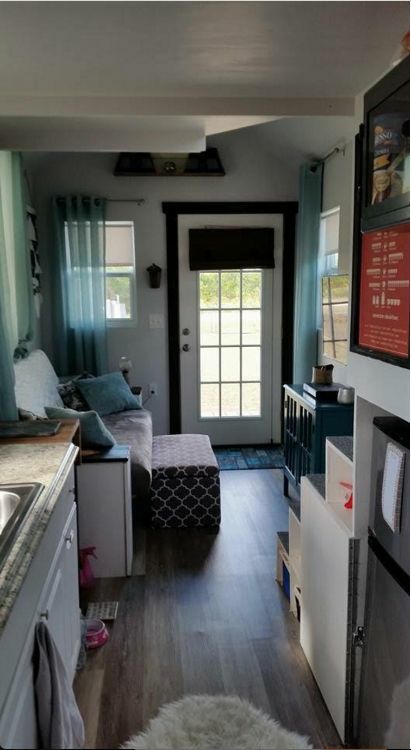 Built in March 2016, this tiny home is a superb piece of craftsmanship combined with artistry to make a tiny home that is a delight to the eyes. 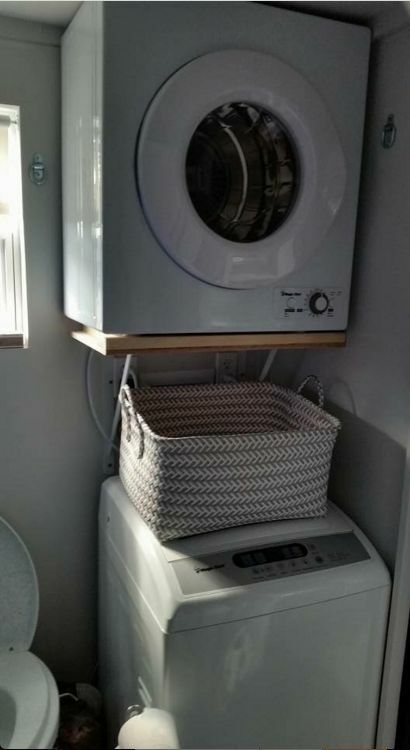 It is proof that you can have both luxury and quality in a tiny space.